Photo by Alex Kozlowski Devin Norris and John Marshall are in the West Virginia Class AAA playoffs for the second year in a row. The Monarchs, who are the 13th seed, will face Musselman on Friday. INWOOD — After winning two games in a row to get back into the West Virginia Class AAA playoff hunt midway through the season, John Marshall must now shake off the effects of losing two of the last three with the post-season set to begin. Friday night the Monarchs (6-4) will hit the road to the Eastern Panhandle to take on No. 4 seed Musselman (9-1) at Waldeck Field and the right to advance to the Class AAA quarterfinals. First-year coach Jason Willis and his John Marshall squad is coming off a disappointing 35-7 setback to arch-rival Wheeling Park last Friday at Wheeling Island Stadium. Meanwhile, Musselmman coach Brian Thomas’ Applemen destroyed Preston by a 70-7 count a week ago and defeated that same Park team earlier this season on the Island. The only blemish on Musselman’s schedule is a 70-0 blasting at the hands of two-time Class AAA state champion Martinsburg in week 10. There could be two main issues for the Monarchs struggles over the last three weeks, the first is that both losses have come to playoff teams in Morgantown and Wheeling Park while the second is losing junior starting tailback/free safety Justin Frohnapfel to a season-ending injury against Brooke. After scoring 76 points during its two-game win streak John Marshall has tallied 59 points over its last three contests, two of those losses. Senior quarterback Jordan Wood leads the way at quarterback, and while the Monarchs are a run-first type offense, Willis tried to play the numbers and had Wood put the ball up 41 times against the Patriots last week, completing 17 for 114 yards. “We knew the size advantage they had on us up-front and thought we might have trouble running the ball,” Willis said. “And we’ve seen some other teams have success against them throwing the football. 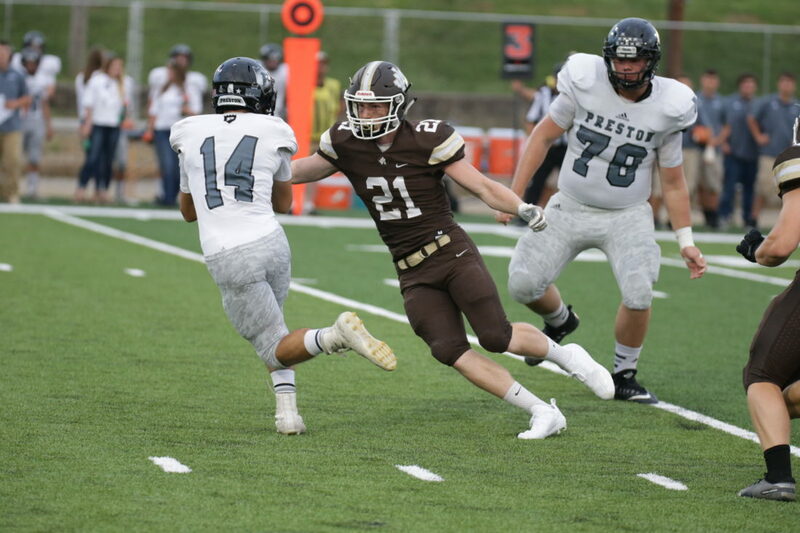 When it comes to running the ball, even without their leading rusher in Fronhnapfel (536 yards, six touchdowns), senior Chas McCool has battled through injuries to record 64 carries for 432 yards and nine touchdowns. Sophomore Alex Burton was limited to just 12 yards on four carries last week but ran for over 200 yards a week earlier against Warren. Senior Roy Rayl had five receptions for 29 yards against Wheeling Park while three other receivers had at least four catches. Defensively the Monarchs allowed 490 yards to the Patriots, a number they will have to work on against a powerful Musselman offense this week. The Applemen have scored 41 or more points in six games this season, including 70 in two of their last three games. Record-setting quarterback Tre Beard leads the offense and had an amazing game against Wheeling Park earlier this year completing 32-of-39 passes for 436 yards and four touchdowns. His main weapon in that contest was sophomore utility Blake Hartman who caught a whopping 15 passes for 251 yards and two scores. “Those two kids are special players,” Thomas said. “I really like this group, we have a great senior class and a nice mix of kids overall. We have some big, physical kids and some real good athletes as well. Beard has thrown for 1,549 yards and 18 touchdowns with four interceptions while rushing for 540 yards and 10 more scores. Hartman is the team’s leading rusher with 1,056 yards and 17 scores and is second in receiving with 30 grabs for 535 more and five touchdowns. Ethan Wilson is the Applemen’s leading receiver with 31 catches for 583 and eight scores while running back Sebastian Oldham is also a weapon. “They are a pretty solid team from what we have seen on film” Willis said. “They really don’t have many weaknesses and are solid everywhere. They have a real nice quarterback and weapons at running back and receiver. “I think we match-up with them size-wise a lot better than we did against Park, but they get to the football very quick. They also have a couple of real nice wins against Morgantown and Wheeling Park. “Honestly, I felt like we played very hard last week but sometimes you play teams that are just better than you. We are trying to continue what Coach (Rich) Goodrich started. He got us here where we are now and we want to continue to build it. John Marshall advanced to the second-round of the playoffs last season after an upset victory at Parkersburg but were eliminated in the Eastern Panhandle the following week by eventual state champion Martinsburg.